These days Universities and Colleges offer alumni program for their students to address career related issues. In order to utilize this wonderful opportunity, you must know how to really leverage connections with the alumni. This post will help you with insights on how to network ad build long term relationships with alumni. Networking is all about building relationships and creating contacts. Networking with people you already know of or know through someone is easy. The real thing is to network with people who you don’t know. The Alumni of your college are an excellent source of career opportunities. Connecting with also help build and manage group of shared relationships with your friends, classmates, seniors, teachers and most importantly, it will help get the exposure you need at the early stage of your career. How do Alumni Associations Normally Help? One of the most common methods of any Alumni network has been to establish and an alumni association. Different colleges and schools have different methods some more organised than others, but almost everyone wants to remain connected with their friends from college. Big network: An alumni association network is a huge network of people from different professions and backgrounds. It helps you find people who have a shared history of the academic institution and are probably at very senior positions in many diverse fields. Career services: Your university or college career center can help you a great deal with career opportunities, starting your career by making an introduction through the alumni association. As a member of an alumni association, you can reach out to members only privileges like resume reviews, job postings, networking events and others. Financial Resources to start new Ventures: Some colleges offer easy loans or access to financial resources through endowments or investor and incubator centres to their alumni members to start their own business ventures. So, if you need to raise money for your business, being a member of alumni can really help you to get that and launch your business. Financial Resources for Higher Studies: Universities/Colleges very often help its alumni members to get bank loans for further studies, business or other career related issues. Others: Apart from the above mentioned services, there are many which alumni associations have to offer. They arrange for recreation, social gathering and other activities. Even though meeting in person is the best way to connect with anyone including an alumni, the social media has come up with various new platforms for alumni networking. With these social media websites, people can connect with their international and local friends who studied with them in school or college. You are most likely to find your college/university alumni group in any of the major social networking sites like Facebook and LinkedIn. Some of the networking tips and effective ways to career network with your alumni are listed down below. One of the most popular social media sites these days is LinkedIn. This website is precisely meant for creating networking in your professional circle. Joining your college/university Alumni in LinkedIn is quite easy. If you are not registered with LinkedIn, at first you must get yourself registered and the rest is all about searching for your college/university. Once you have found it, you can join it and can at once get connected with all the other members in the group. If your group doesn’t exist, why not create a new one and invite the people you already know. They in turn will invite other people they know but you don’t. This will help the group grow in the future. Facebook is ubiquitous these days. Search for the Facebook pages of the school and college you attended. If there is a special page of your school, then you can find other people who are already followers and friends. Another way is the Facebook search option in which you can type the name of your classmate, the school and the year in which you studied. This will help you in reaching peoples who studied with you and you can get connected with them. Twitter is the perfect place for following friends non-intrusively. This is considered to be the perfect communication tool for people who wish to connect with alumni. This website can also be used for finding work because various alumni groups have started hosting chats on Twitter which consists of advice, tools and resources from alumni for job hunting and advancement of career. Graduway is a highly amazing tool which gathers all the information from social networking websites to keep the database of alumni networks updated. This tool is considered to be extremely beneficial in getting in touch with those who accompanied you in college and school. So, check it out and use it to get connected with your old day friends and fellows. Ever true is also another network tool which allows alumni to connect with each other. This service helps in collecting contact details of alumni from various social media websites so that their former students can easily connect with each other. You can try out this tool to facilitate the professional networking process. Networking with alumni is the best way to build relationships and contacts and this also helps in getting advice regarding your career. But, networking in the proper way is extremely important to build a good reputation and long-lasting relation. 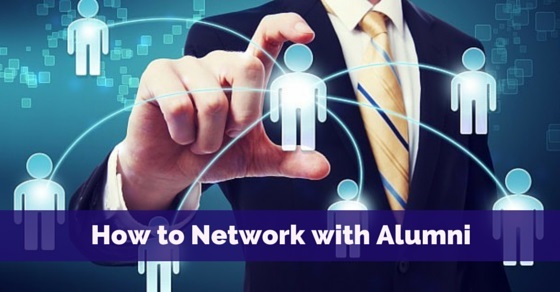 There are some mistakes which you should avoid while networking with alumni. If hunting for a job is one of your aims to connect with alumni, then make sure that you don’t spam alumni networks by sending your resume to everyone present on your alumni list. During the earlier times, people eagerly connected with alumni because this was a great way to connect with people who accompanied them in their academic life. But, now with social media because there are so many different networks that not everyone has the time and energy to talk to people in all networks. So, network but with a clear purpose that interests the other person as well. Showing people that you are desperate to find a job during alumni networking doesn’t help. This will create a negative impression about you and your fellow alumni might start avoiding you. This can also make your fellow alumni uncomfortable, particularly, if they do not have a solution to your problem. Make sure that you do not carry your resumes to any alumni career event network and also avoid going on about your job frustrations. It is important that you build contacts and trust in those contacts before you ask for any help. Engage in conversations with people, sharing knowledge about something which might help them. After building a trust in the minds of your fellow alumnis, then take the next step of asking for any help that you need. But before that seeking their help is not the right approach this gives a bad impression in their mind about you. A major mistakes that many young professionals make is asking your fellow alumni for a job directly. This doesn’t create a great impression about you, but it will also be a waste of time if you are not aware of whether that person is indeed responsible for hiring or not. The smarter way is to ask them about how they and their organizations are doing and whether they are proposing to expand operations and understand whether your skills would be in demand in that organization or not. Also use this opportunity to understand if that organization would be good place for you to work or not. If it isn’t you might just be trading one miserable job for another. So don’t ask for a job directly, ask for the context and assess if there is an opportunity for you to possibly work at the organisation of the fellow alumni. In the modern world, which is driven by technology, colleges and schools all over the world are reaching out to former students with the help of social media, helping them learn more about campus events, programs, and what the school has to offer. More and more schools are realizing that social interaction with students shouldn’t end once they graduate. These days, simply getting a college degree isn’t enough to land you a great job after graduation. You often have to have the right experience and know the right people to get a job in those first few months career after college. The college authorities also feel that students should not end their social interaction after completing their graduation. The best way to network with alumni is to start by connecting with people whom you know. Often it is not what you know, but, who you know that makes the difference. Alumni networking nowadays, is more focused and is based on particular targets and goals that people set for themselves. It could be a new venture, or a partnership, or a potential sale, or investor pitch and many more. Networking with alumni can help you get advice about how to move ahead with many of your goals.